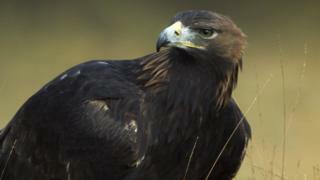 A new wildlife project hopes to bring the golden eagle back to Wales after nearly 200 years. The golden eagle is one of Britain's rarest birds of prey and can only be found in small areas of Scotland and Northern Ireland. There are just around 500 breeding pairs of the birds remaining in the wild after they were hunted down in the 1850s. But now a new project hopes to reintroduce them to the Snowdonia region in Wales. If the plans go ahead, eagles could be re-introduced to the area by 2020. Can Newsround spot a golden eagle? But not everyone's keen on the plans. Some people, including farmers, are worried that their animals could become prey to the birds. Golden eagles are large birds with a wing span of up to 2.2 metres and can carry prey weighing up to 5kg - that's means small animals could be in danger. Snowdonia, known as 'Eryri' in Welsh, is home to Snowdon, the highest mountain in Wales. 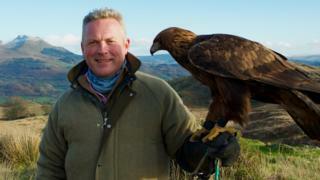 BBC's Countryfile Winter Diaries has made a special programme all about the golden eagle and the plans to bring it back to Wales.